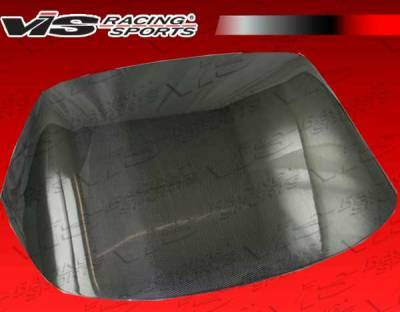 VIS Carbon Fiber Hoods and Trunks are made from the finest carbon fiber material available. All VIS Carbon Fiber Hoods and Trunks are manufactured using a two-part construction design. The top layer utilizes a 100% ISO certified, Grade A carbon fiber material. 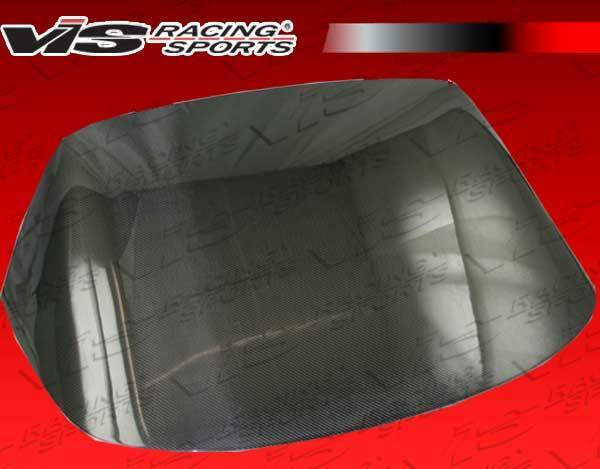 The carbon fiber material is bonded to the hood using a high grade epoxy resin , and then finished with an ultra-clear (Poly Shield), UV-protective polyurethane coating to ensure a high gloss finish. Marrying aesthetics and functions, we pioneered the use of one-piece, smooth underside shell which complements the fine finish on top, and at the same time strengthens the product's structural integrity. The edges of each hood or trunk are meticulously smoothed by hands to insure high-quality finish all around. The result is a carbon product that is unparalleled and excels above all else in quality, durability, and aesthetics. All VIS Carbon Fiber Hoods and Trunks come with a VIS badge of authenticity. Please be sure to look for the badge when purchasing. Due to the unknown nature of the intended uses of these products, hood pins are required. These products are intended for off-road use only, unless your local and state laws state otherwise.